As the Spotlight Series continues this week for NYRB, I hope that you have already found something from this fantastic publishing house that piques your interest! If you haven't yet, you can visit other reviewers for a partial look at NYRB's wide variety of novels and novellas. 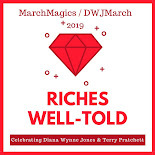 Because we focus on all ages here at We Be Reading, I chose a children's book for my second read -- one that I had heard about a couple of years ago but actually had trouble finding. Thanks to The New York Review Children's Collection, The 13 Clocks showed up in our library system a few months ago in a beautiful hardbound edition with color illustrations by Marc Simont. 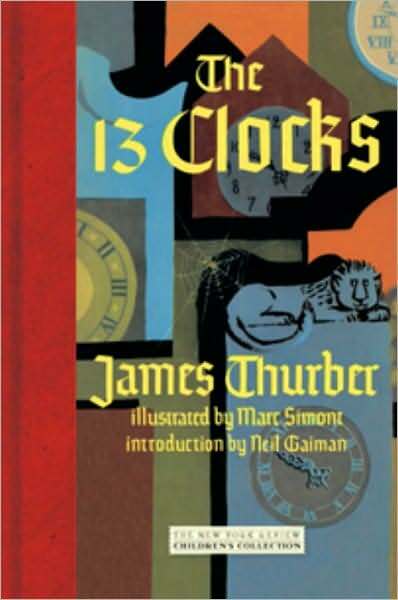 With an introduction by Neil Gaiman which declares "This book, the one you are holding, The 13 Clocks by James Thurber, is probably the best book in the world", one can only go into this story with the highest of expectations. Luckily he brings it down a notch in the next sentence with "And if it's not the best book, then it's still very much like nothing anyone has ever seen before, and, to the best of my knowledge, no one's ever really seen anything like it since." And with that statement, I have to agree. This is a unique book in many ways and, while it might not be a good fit for all young readers, will certainly still have the ability to expand the imaginations of a few brave youngsters. Originally published in 1950, this is a fairy tale of sorts with a prince and princess, evil Duke and a woman who cries precious gems. The prince is in disguise and he wants to win the hand of the princess but the Duke isn't going to make it easy. The prince is sent on an impossible task that only becomes a bit less impossible with the help of a mysterious personage known as "the Golux". There is also quite a bit of word play, especially by the Golux, which makes this book a bit more special than your average simple chapter book. Because of the complexity of the language, I didn't fall in love immediately with The 13 Clocks but I did almost flip back to the beginning and read it again in the same sitting. I'm now very curious to read Thurber's other children's book, The Wonderful O, also re-released by NYRB. Support our site and buy The 13 Clocks on Amazon or find it at your local library. We borrowed our copy from the library. I bought this a couple of weeks ago! Sounds like a beautiful children's book! Sigh.. Neil Gaiman can convince me to read almost anything. That was a great passage you shared, though I sort of drifted off into the rhythm while reading it and forgot to pay attention to what was actually HAPPENING in the passage. Interesting.. I've put it on hold at my library.. always looking for good children's books to review. Thanks for bringing my attention to it! I would also probably find the verse distracting. Like booktobook, I think I stopped paying attention the story and just focused on the language. But I love the cover and the story premise. sounds great :-) thanks for hte review. I have to say this makes me intrigued! Lenore - I would love to hear what you think of it! Chris - It's definitely out of the normal realm of today's children's books. Quite unique! Cariitoo - I hope you can find it too! It's a magical little story. Booktobook - Yeah ... I know what you mean! Gaiman is a trusted source for me too. Aarti - Luckily the whole book isn't in verse. It goes in and out in a strange way. Jenners - It's an out of the norm book that some people will love and others won't. Those always seem to be the best books! 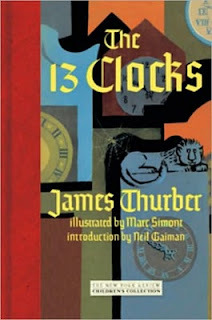 I've heard good things about The 13 Clocks, though for some reason I thought it was less of a kings-and-queens type fairy tale and more steampunky-clocks-and-boats. It's one I definitely need to read! Jenny - I thought the same thing. Weird!